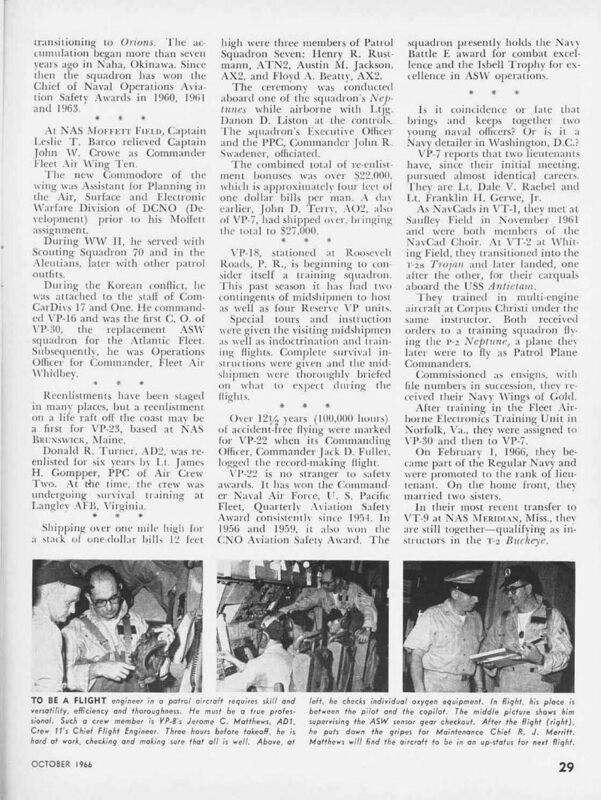 A BIT OF HISTORY: "MAR/JUN67--On 9 March 1965 Commander Harry G Rich relieved Commander D.R. 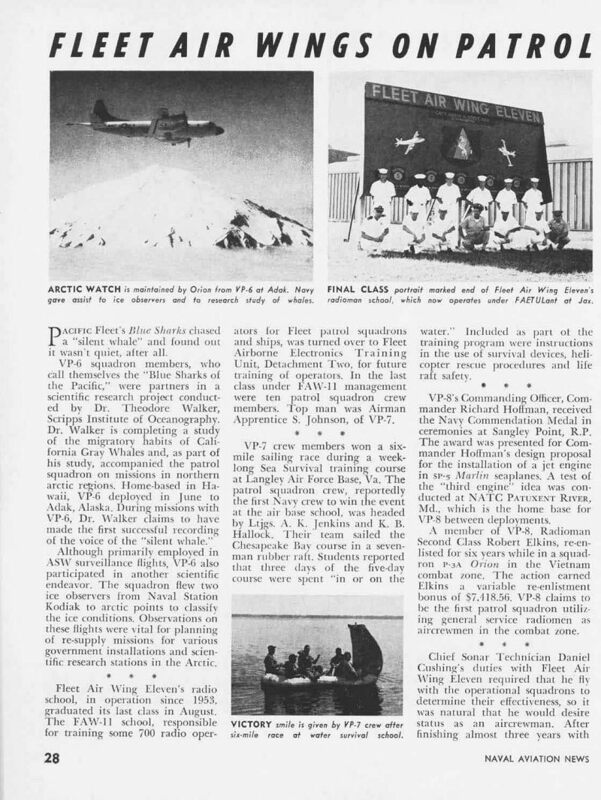 "Doc" Johnson as CO. Change of Command festivities were interrupted by orders to deploy three aircraft to Iceland "immediately" to observe Soviet maniievers. Appropriately clad in the new CO's traditional orange and black "Tiger Suit" complete with tail. Commander Rich calmly issued the necessary orders and, the deployment went off without problem. 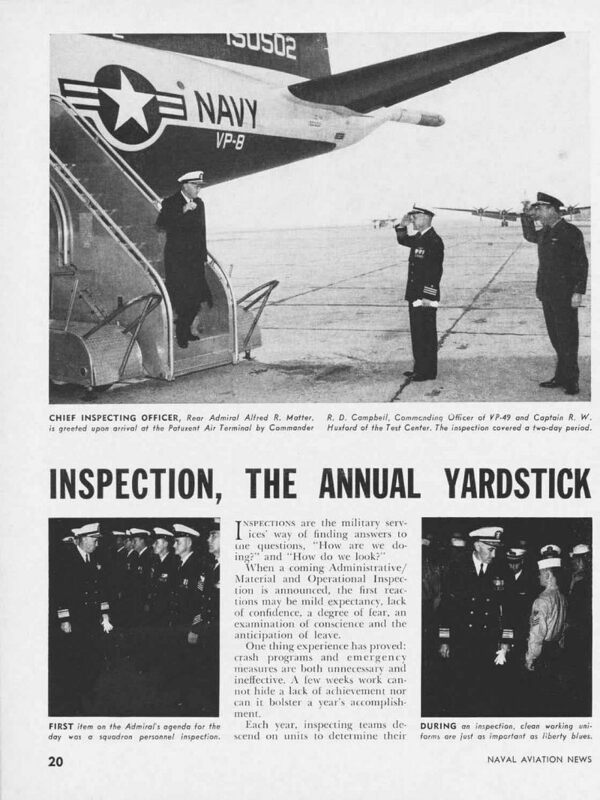 This incident was a precursor of an exciting tenure for the new CO.
At this point in time, despite apparently good morale, the squadron stood #13 out of 15 Atlantic squadrons in competitive standing and #5 out of 15 in reenlistments. Commander Rich established long range goals to remedy this situation. These goals were based upon a willingness to be creative and innovative and to respect inputs from all hands. This approach turned out to be a perfect fit for the squadron's later assignment to Task Group DELTA, the lead Atlantic squadron for the development, test and evaluation of new ASW tactics, equipment and procedures. 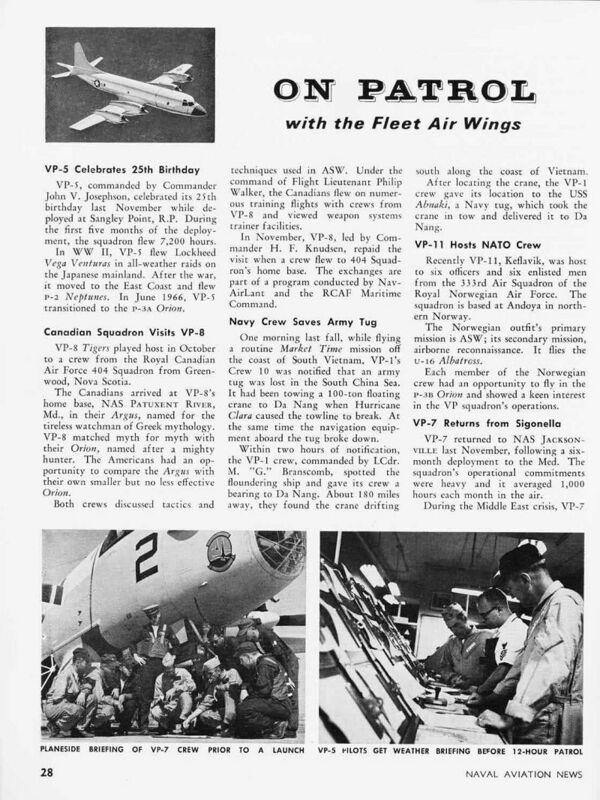 VP-8's spirit and competence was put to the test in June through October 1965 with additional deployments to Iceland for participation (uninvited) in the Soviet summer fleet exercises. All flight crews enjoyed exceptional success in detecting and tracking Soviet submarines and the squadron received commendations from CINCLANTFLT, COMASWFORLANT and COMFAIRWINGSLANT for their efforts. Not all was work, for short visits were made to Norway and Scotland. At Patuxent, VP-8 softball, basketball and touch football teams came in first in base intramurals and VP-8 was awarded the "Captain's Cup" for being the best athletes on base. 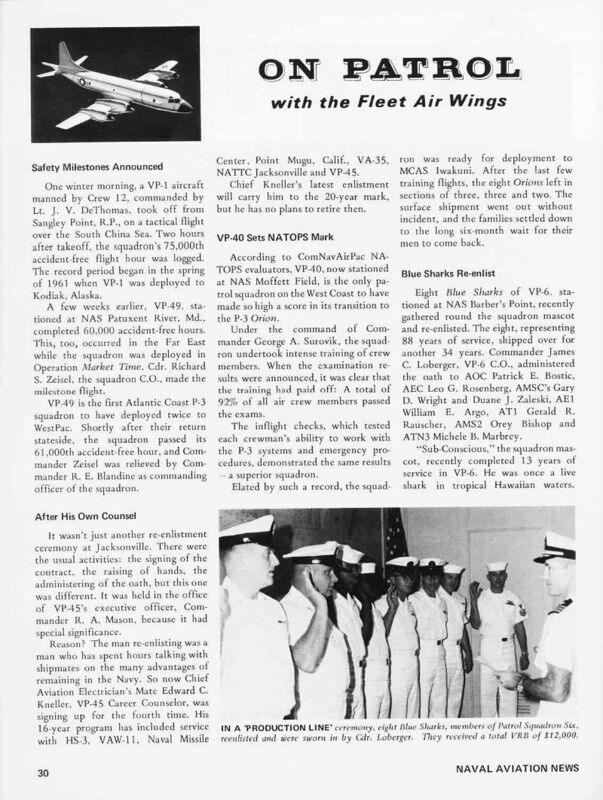 Under LTJG Tom Hall (who would himself command VP-8 in 1979-80), a vigorous reenlistment program brought the squadron from last to first place in just six months. 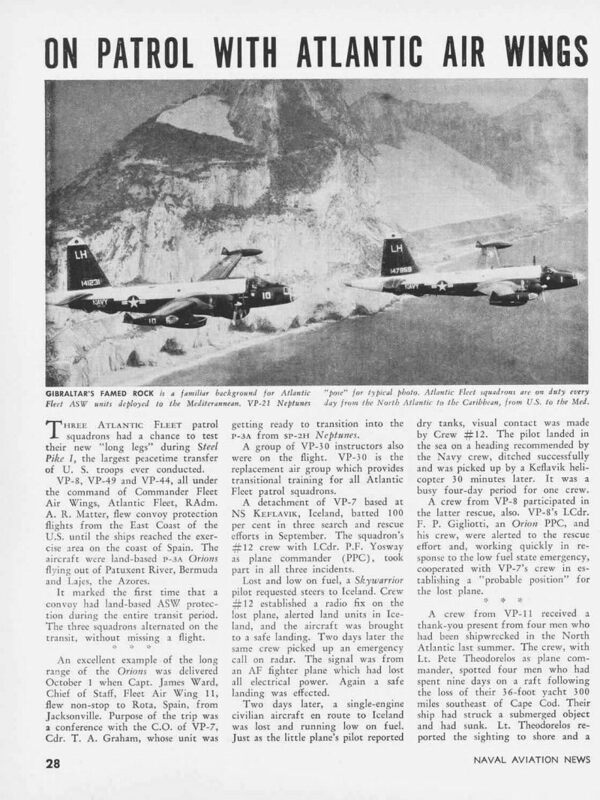 A winter detachment deployment in November and December 1965 to Argentia, Newfoundland (whose weather made Keflavik look like Miami Beach), with squadron aircraft making a number of barrier flights from Argentia to Lajes in the Azores, completed operations for 1965. 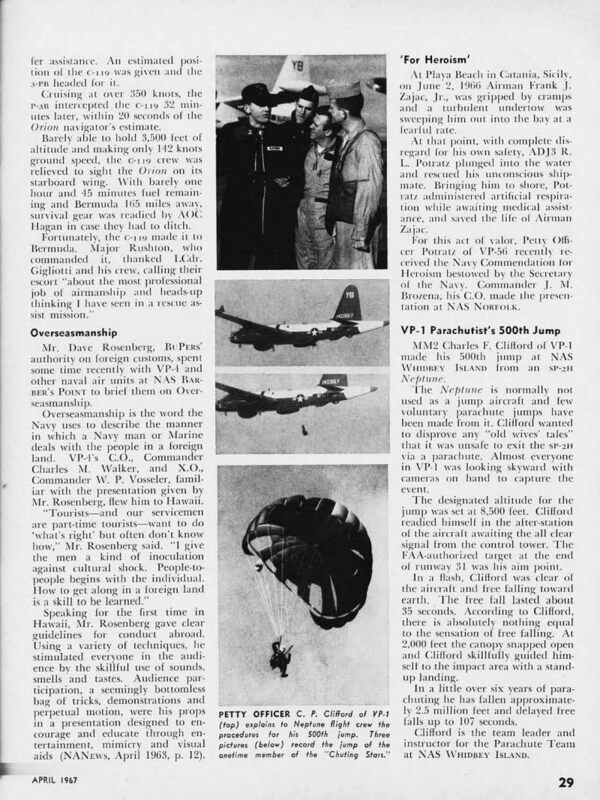 The squadron's new confidence and competence were reflected in the results of the intensive training experienced during Operation SPRINGBOARD in February of 1966. All crews returned from SPRINGBOARD with the top readiness rating of "ALFA" qualification and the squadron was ready to tackle any and all assignments. 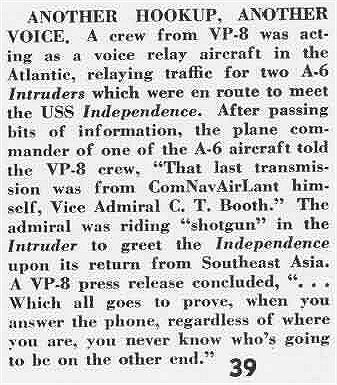 Commander Rich was relieved by Commander Richard A. Hofiman on 31 March 1966. 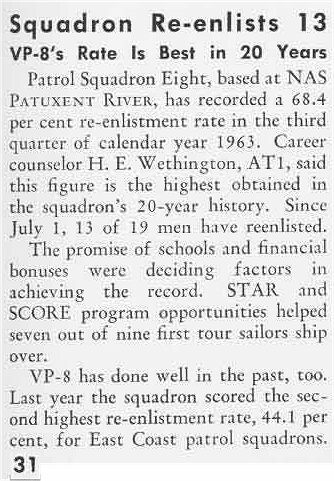 Rear Admiral Rich would later comment that his only regret as CO of VP-8 was in underestimating the inate capability of VP-8 personnel and in not setting even higher goals. When Commander Hoffman assumed command, with Bob Gallagher as his great Leading Chief, the squadron was handed a unique and very challenging assignment. 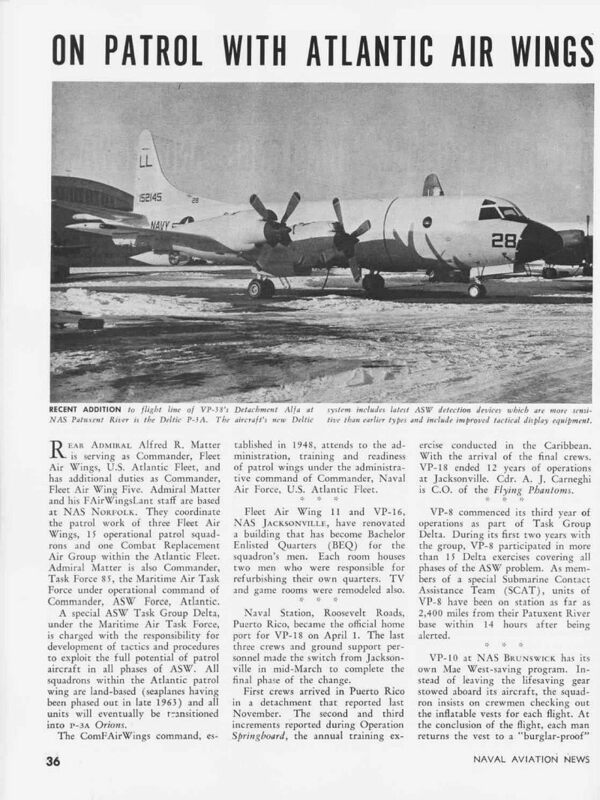 VP-8 had been selected to be the first Atlantic patrol squadron to deploy to the Pacific in support of Seventh Fleet operations in Viet Nam. The squadron would be based in the Philippines at the Naval Station Sangley Point in Manila Bay and would be tasked to fly MARKET TIME anti-infiltration patrols off the Vietnamese coast and YANKEE STATION ASW flights in support of the carriers of Task Force 77. The next few months were spent in pre-deployment planning and preparation. 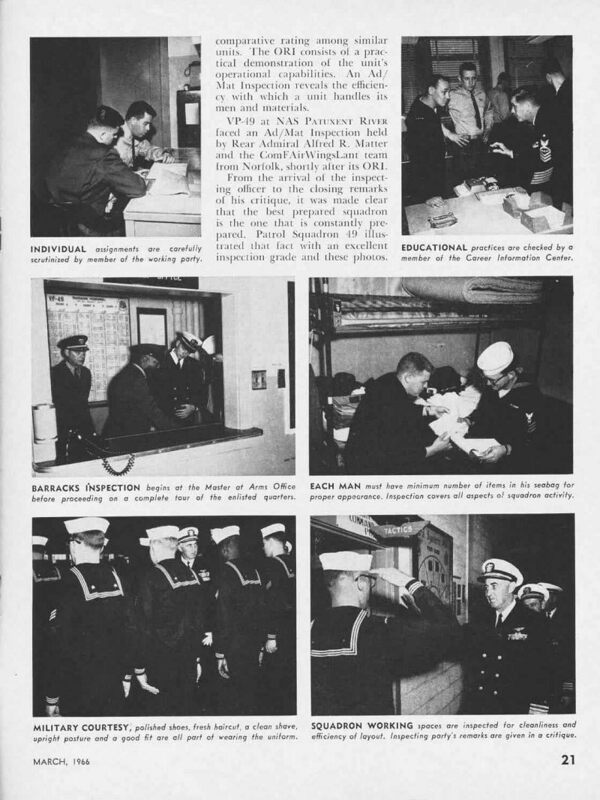 Briefings were received from COMFAIRWINGSPAC in Moffett Field, California, intensive training was received in infiltrator ship and junk recognition, personnel manning and materials were brought to war levels, flight crews were sent to Survival Escape Resistance and Evasion (SERE) courses in Bronswick, Maine and Warner Springs, California, medical shots and tropical environment working conditions lectures were received and plans were made for personnel and material deployment via Military Airlift Command C-141 STARLIFTERS. 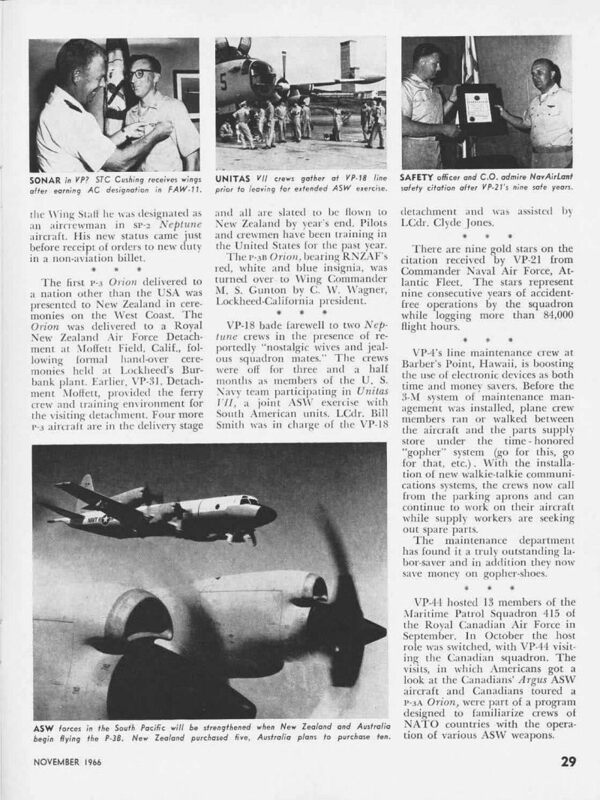 Squadron aircraft deployed via MofTett, Hawaii, and Guam and upon arrival at Sangley in June 1966 the squadron became TV 72.3.2 and immediately started operational flights. Most operations were flown from Sangley, but squadron aircraft visited Saigon, Hong Kong, Bangkok, Tokyo, Okinawa and lwakuni, Japan. A hurricane evacuation was flown to Tainan in Taiwan and Crew I participated in Exercise SWORDTHRUST out ofTownesville, Australia with briefings in Sydney. 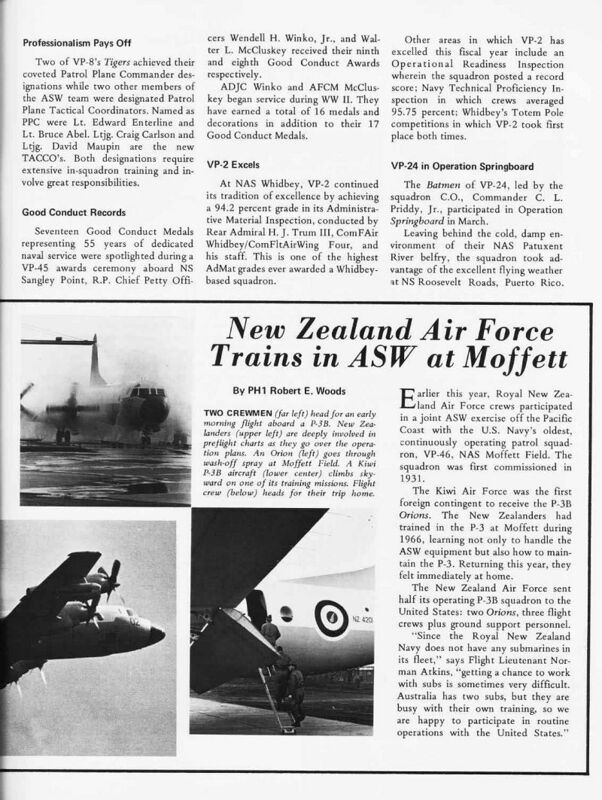 During this joint US/RAF/RAAF ASW exercise, the VP- 8 crew achieved three out of the four exercise submarine "kills" (including one made from the nighttime detection of a snorkle by "Eagle Eye" Chief John CoUis). 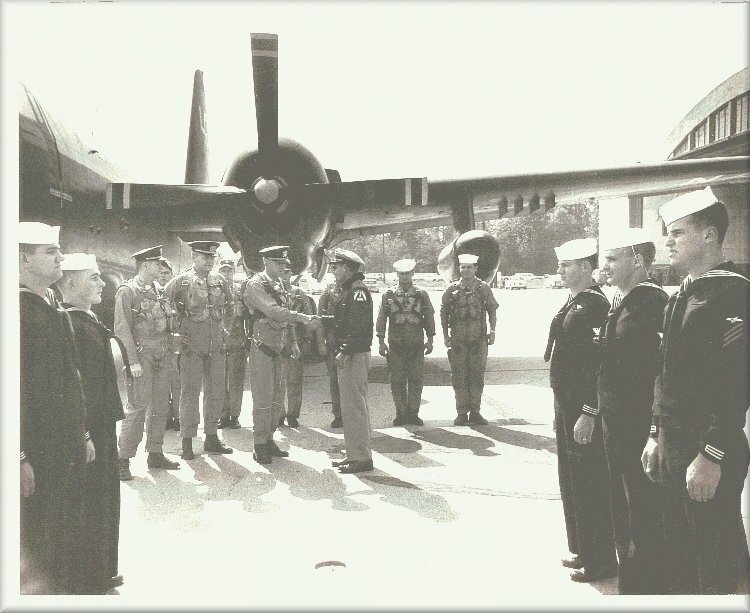 The crew also formed an honor guard for the visit of President Lyndon Johnson to Townesville, and was inspected by the President and the Prime Ministers of Australia and New Zealand. During this deployment, the present VP-8 insignia of a cloud-wreathed tiger attacking and crushing a submarine was conceived by Commander Hoffman and executed by LTJG Steve Dansker. In the six months of deployment, the squadron flew 7700 accident-free hours and met every commitment in a sterling manner. Commendations were received from all operational commanders in recognition of the squadron's outstanding record. 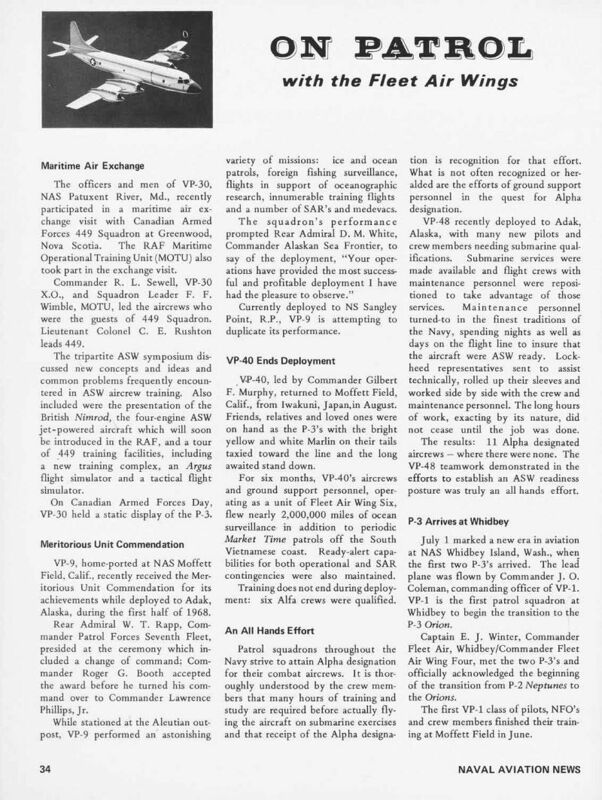 All crews returned ALFA qualified and all flight crewmen were awarded Air Medals. 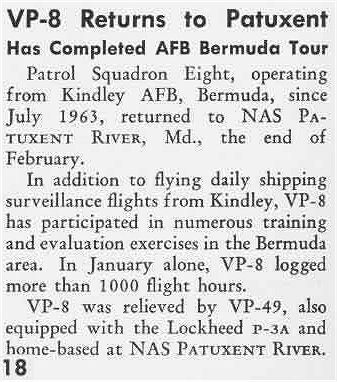 Return to Patuxent River in December 1966 was made from Sangley direct to Barber's Point, Hawaii with a fuel stop at Guam and from Barbers non-stop to Pax. Rear Admiral A.R. Matter, COMFAIRWINGSLANT flew up from Norfolk to personally welcome the squadron home. Commander H.F. Knudsen assumed command on 28 February 1967. 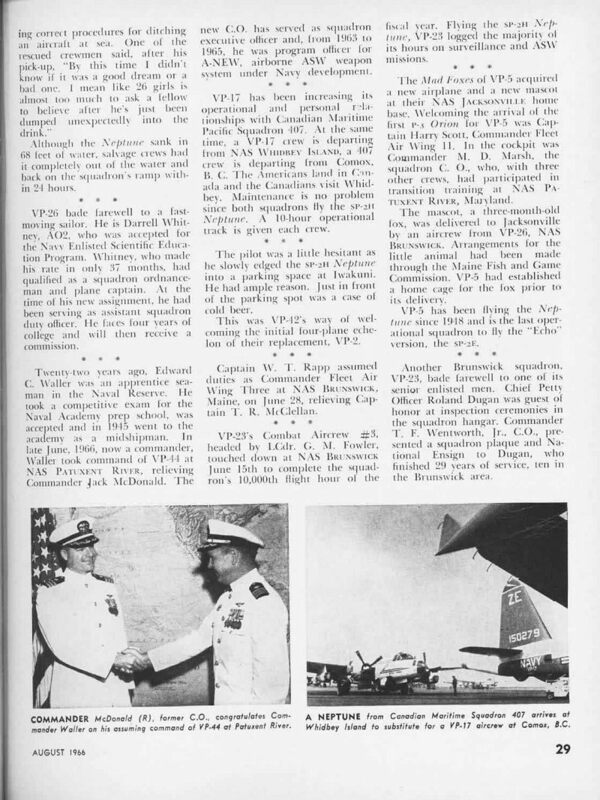 Change of Command ceremonies were highlighted by the award of the Battle Efficiency "E" to VP-8 as the best patrol squadron in the Atlantic Fleet The squadron was also awarded the CNO Safety Award and the outgoing skipper was presented the Navy Commendation Medal in recognition of the squadron's performance in Viet Nam. 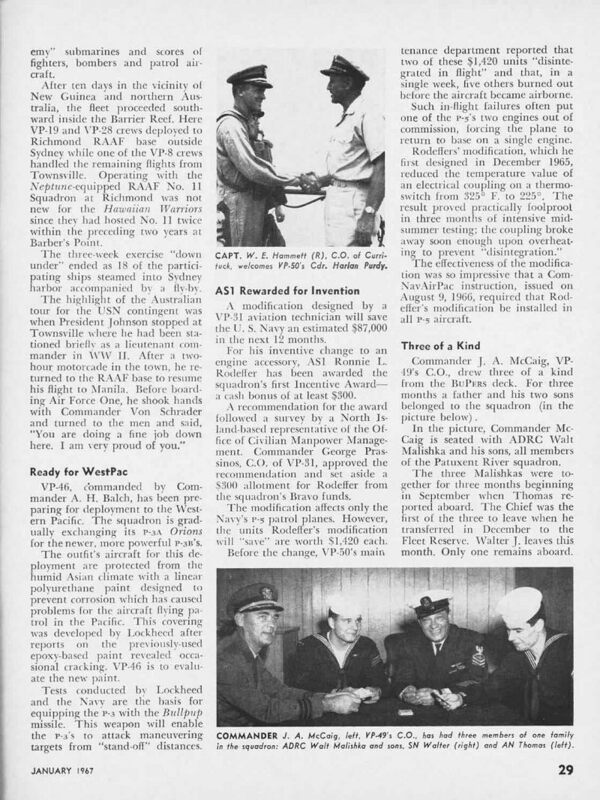 Commander Hoffman remarked that the award was really the squadron's due to the fact that he had the "honor to command the best squadron in both the Atlantic and Pacific Fleets"..." Contributed by Beth Perry (E-Mail Removed By Request) NEWSLETTER: "VP-8 Alumni Association" World War II Stories, and more!!! 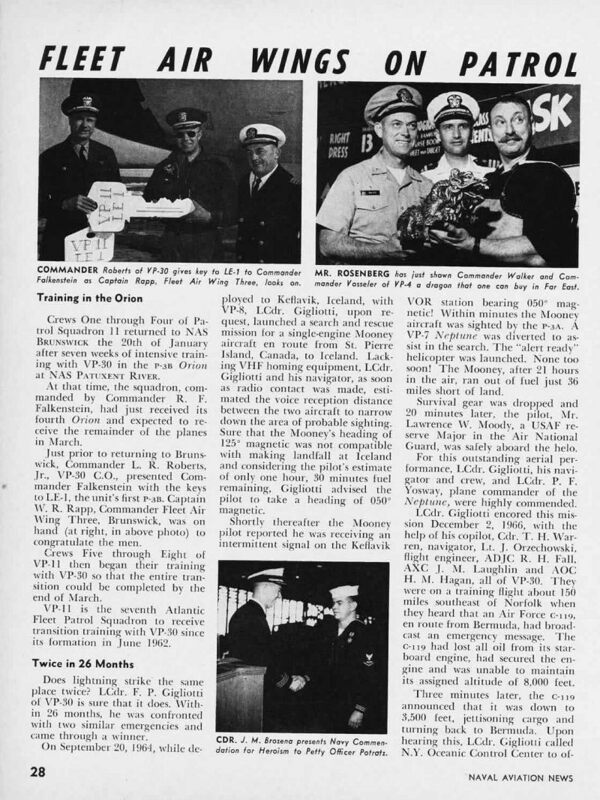 A BIT OF HISTORY: "00XXX67--1967 was spent with deployments to Iceland, Argentia, Newfoundland, and Bermuda. Commander Knudsen was relieved by Commander T.F. 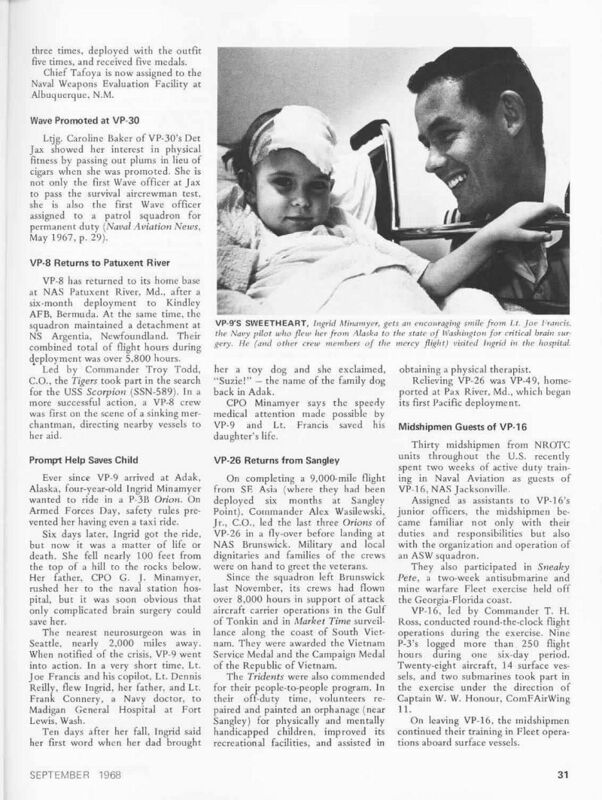 Todd on 12 March, 1968..." Contributed by Beth Perry (E-Mail Removed By Request) NEWSLETTER: "VP-8 Alumni Association" World War II Stories, and more!!! 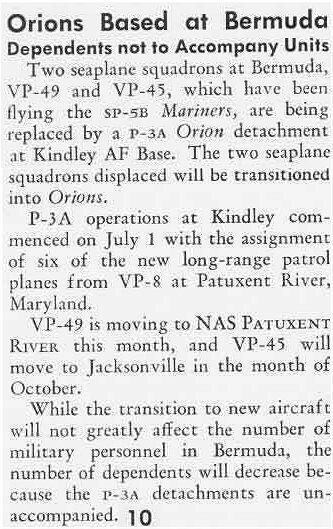 A BIT OF HISTORY: "01JAN64--On January 1, 1964, the remaining aircraft of VP-49 in Bermuda were moved to Patuxent River, and VP-8 came under the operational command of Commander ASW Group Bermuda. 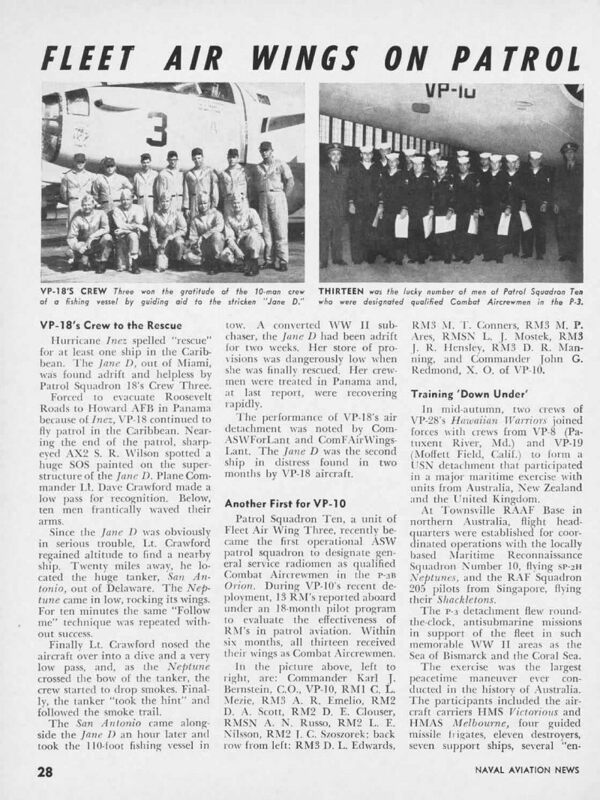 The entire squadron deployed to Bermuda at this time with an administrative and maintenance detachment remaining at Patuxent River..." Contributed by Beth Perry (E-Mail Removed By Request) NEWSLETTER: "VP-8 Alumni Association" World War II Stories, and more!!! 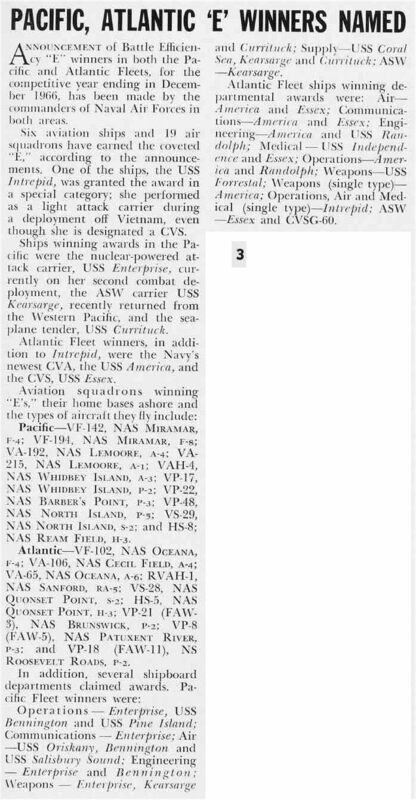 A BIT OF HISTORY: "24FEB64--On February 24, the squadron was relieved from its Bermuda commitments by VP-49 and returned to its home base at Patuxent River, assuming duties as a member of Task Group DELTA, one of four special U.S. Navy ASW groups -- which may comprise carriers, destroyers, and patrol planes -- operating in and over the Atlantic. 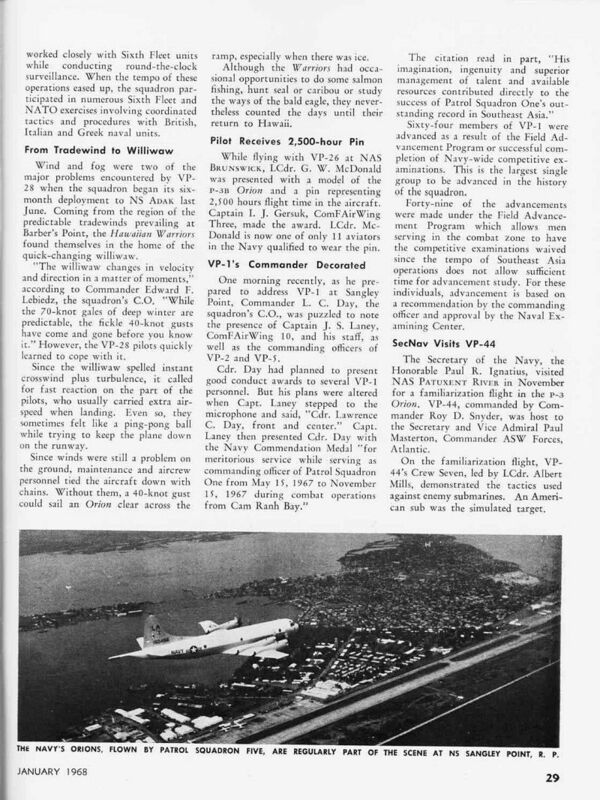 Task Group Delta, including VP-8, has a primary responsibility to keep watch on the Atlantic sea lanes, but is also active in developing new ASW tactics and operating procedures for patrol aircraft in the surveillance and barrier areas of the Navy's ASW effort..." Contributed by Beth Perry (E-Mail Removed By Request) NEWSLETTER: "VP-8 Alumni Association" World War II Stories, and more!!! 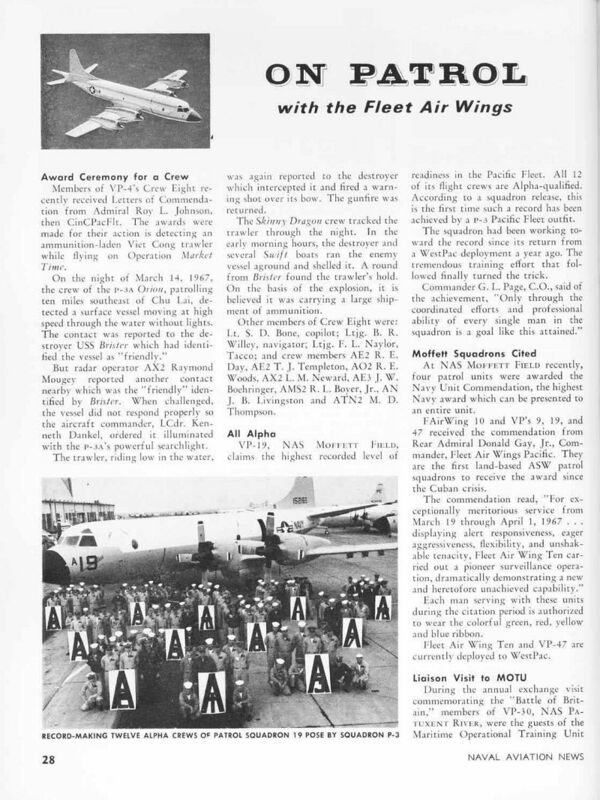 A BIT OF HISTORY: "00JAN63--In January 1963, VP-8 entered Task Group DELTA. The squadron deployed to Puerto Rico to participate in Operation SPRINGBOARD on January 25. 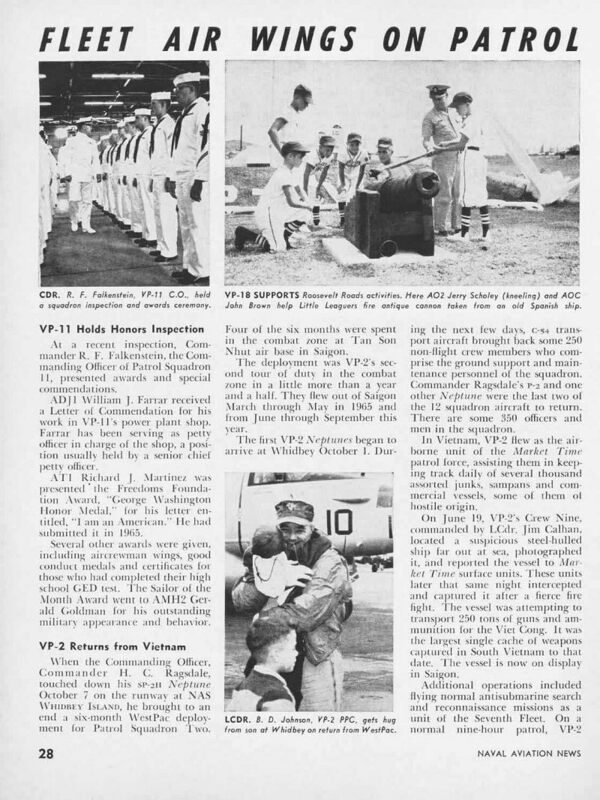 During this deployment, flights were made to St. Croix, Trinidad, and Barbados..." Contributed by Beth Perry (E-Mail Removed By Request) NEWSLETTER: "VP-8 Alumni Association" World War II Stories, and more!!! 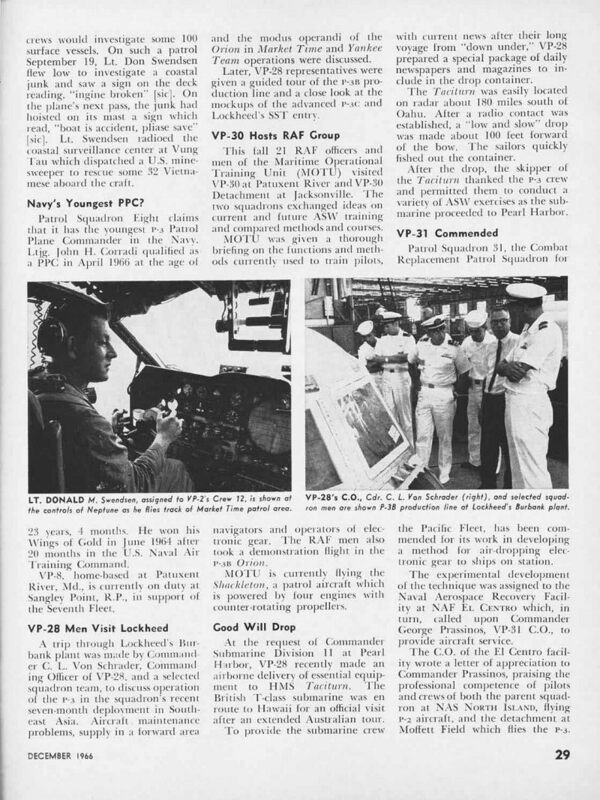 A BIT OF HISTORY: "00MAR63--From 9 - 17 March, 1963, VP-8's LC-1, piloted by Commander C.W. Cook and LCDR A.H. Balch, became the first Orion to complete a transatlantic flight by a P3A when LC-1 flew non-stop from Norfolk to West Malling, England in nine hours and five minutes. In an effort to show the Royal British Navy the newest United States ASW weapons system, the aircraft visited Turnhouse, Scotland; Ballykelly, Ireland; and Keflavik, Iceland before returning to home base on Mary 17th, becoming the first of its type to visit these countries. 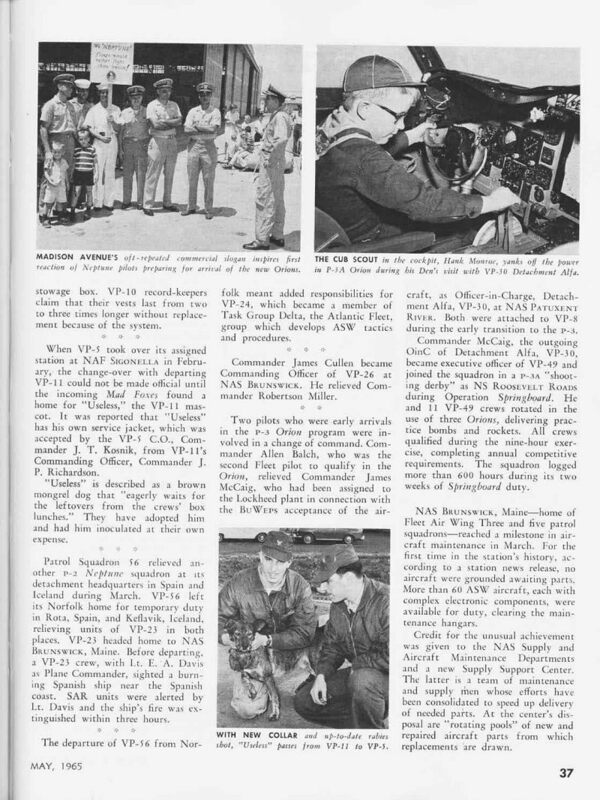 ..." Contributed by Beth Perry (E-Mail Removed By Request) NEWSLETTER: "VP-8 Alumni Association" World War II Stories, and more!!! 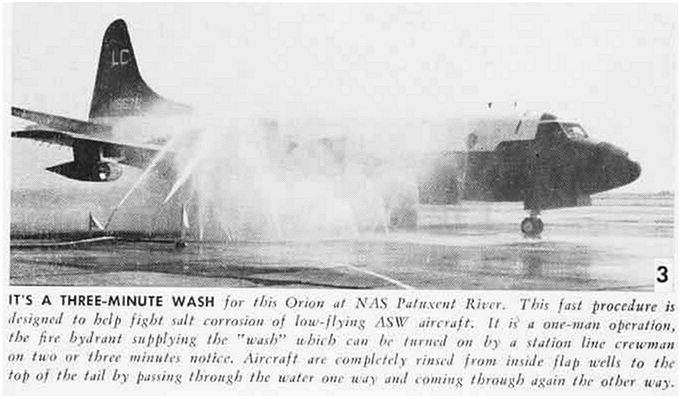 A BIT OF HISTORY: "APR/MAY63--After the Cuban crisis, VP-8 completed training exercises at the NS Roosevelt Roads, PR . 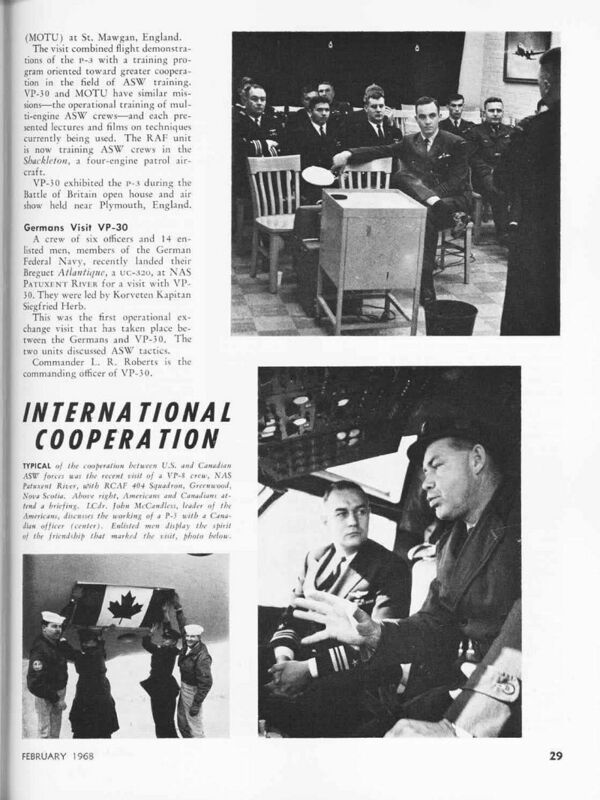 Then deployed to participate in a major NATO exercise FISHPLAY, operating from a Royal Air Force base at Ballykelly in Northern Ireland from April 16 until May 15, 1963..." Contributed by Beth Perry (E-Mail Removed By Request) NEWSLETTER: "VP-8 Alumni Association" World War II Stories, and more!!! A BIT OF HISTORY: "00JUN63--On June 30, 1963, six aircraft were deployed to Kindley Air Force Base, Bermuda. 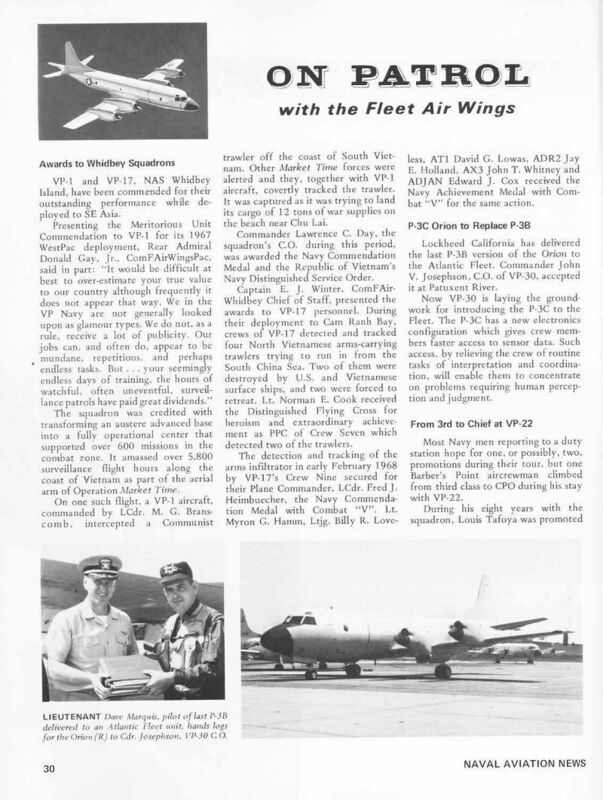 The detachment augmented PATRON 44 and 49, both of which were undergoing transition to the P3A Orion..." Contributed by Beth Perry (E-Mail Removed By Request) NEWSLETTER: "VP-8 Alumni Association" World War II Stories, and more!!! 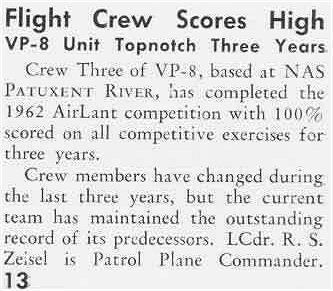 A BIT OF HISTORY: "...00XXX62--Five aircraft and a support contingent deployed to Puerto Rico in January 1962 for participation in Exercise SPRING-BOARD while the remainder of the squadron continued operations with Task Group ALPHA. In February 1962 the squadron participated in Operation SLAMEX. 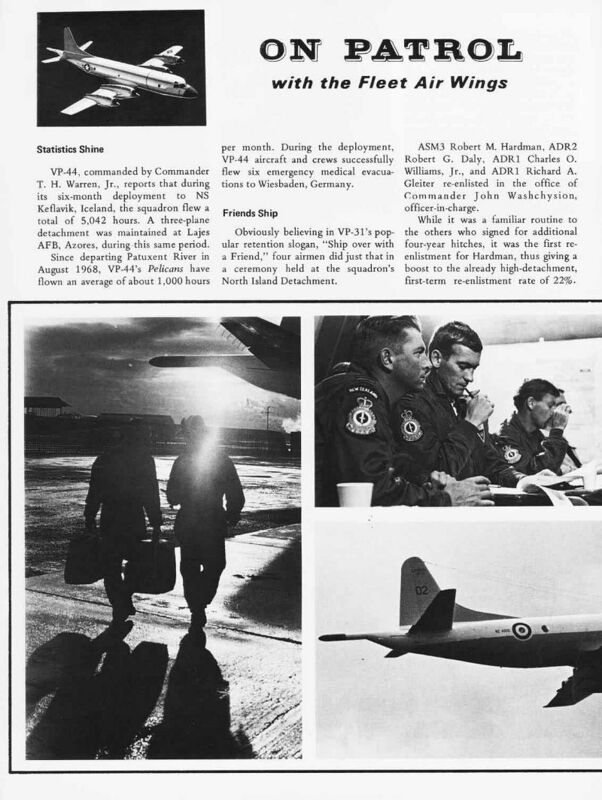 During January, February, and March 1962 the squadron continued to fly surveilance in connection with NASA launching facility at Wallops Island, Virginia. In March 1962 a second deployment was made to Puerto Rico to complete Operation SPRING-BOARD training. 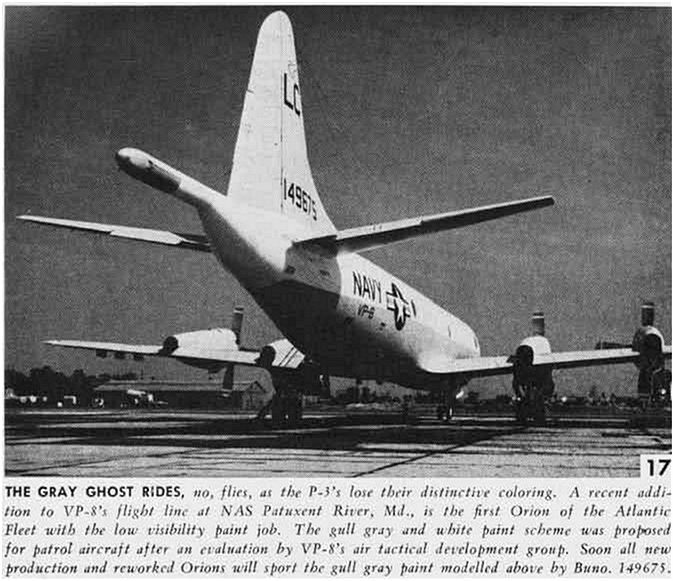 In May, 1962 the squadron initiated a training program for all personnel in preparation for the introduction of the P3A Orion aircraft. 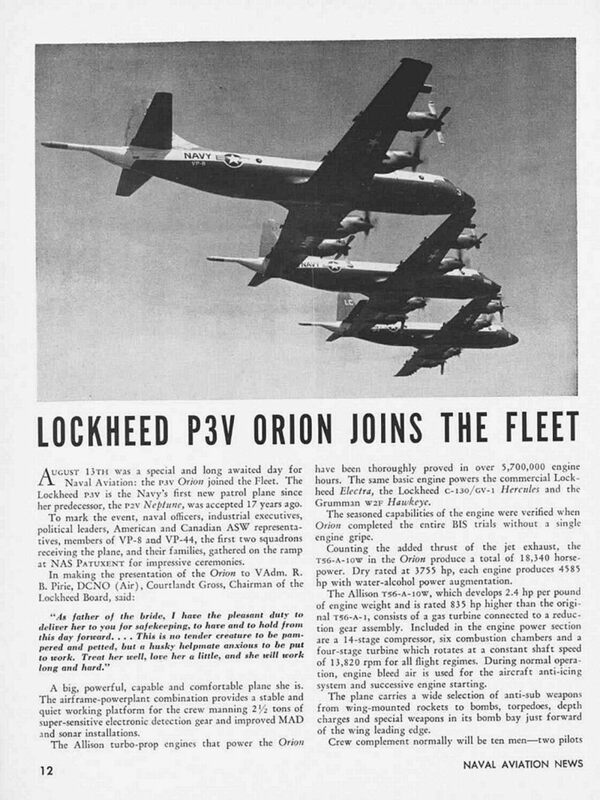 VP-8 was the first operational squadron to be equipped with the P-3 Orion. 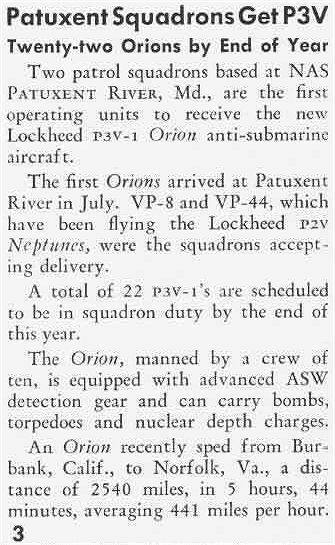 On 8 August 1962, Commander Creighton W. Cook, then VP-8's commanding officer, flew the Navy's new ASW aircraft on its first operational mission -- some five days before the Orion was officially inducted into the Navy...VP-8 was scheduled to become fully operational with the Orion on 1 January 1963, but it is a measure of both the squadron and the P-3 airplane that this deadline was bettered by a considerable margin. 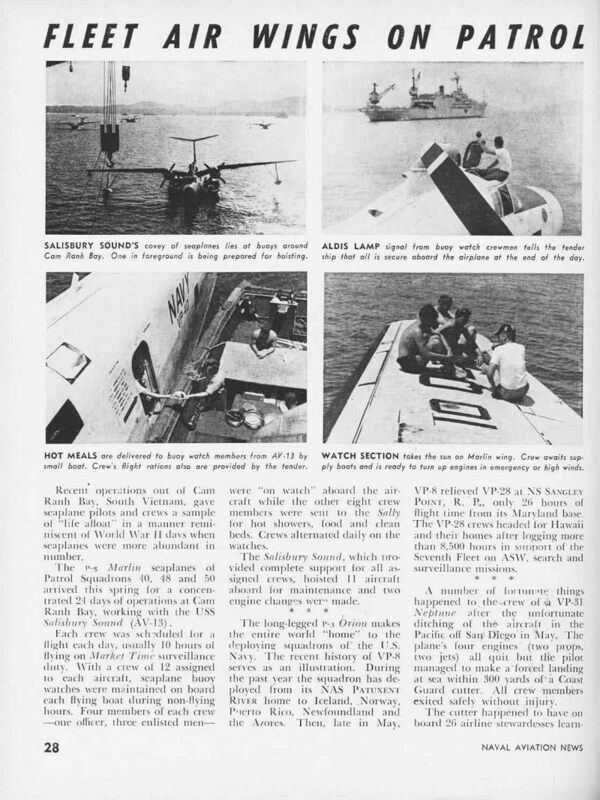 The original program was accelerated, partly due to the rising crisis in Cuba, and October 1962 found VP-8 in active support of the Cuban quarantine operation with aircraft deployed to Bermuda and the Azores. From these islands, VP-8 flew about 1,000 hours in all weather conditions, providing surveillance of shipping bound to and from Cuban ports, and undertaking various anti-submarine tasks -- a meritorious achievement considering the squadron was operating a new type aircraft from advanced bases with a minimum of support. 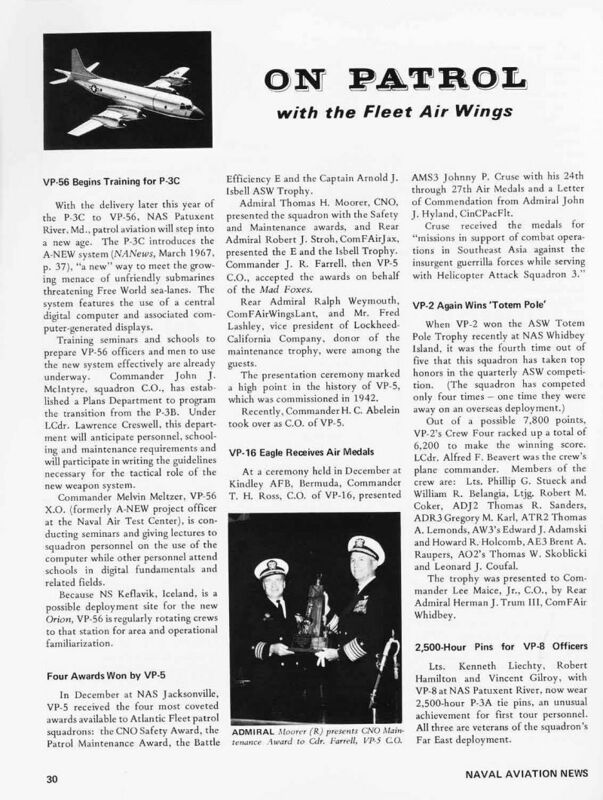 The P3A was officially presented to the fleet operating forces on August 13, 1962 by Mr. Gross, Chairman of the Board of Directors of Lockheed Aircraft Corporation of California. The aircraft was accepted for the Navy by Vice Admiral R.B. Pirie, Deputy Chief of Naval Operations (AIR) who presented it to Patrol Squadron Eight. 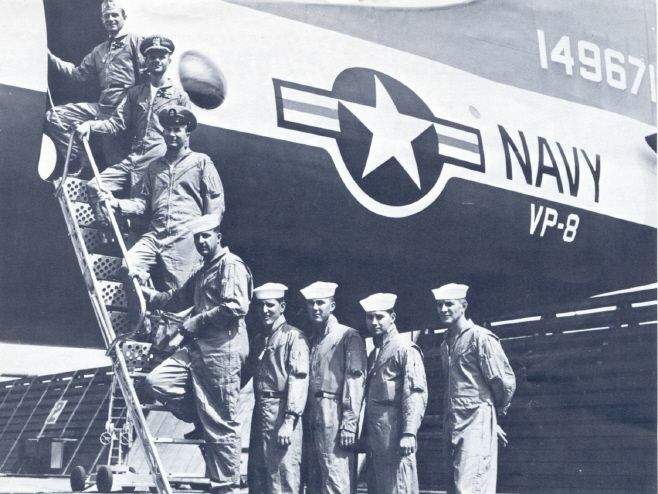 On 1 Sept. 1962 VP-8 received its second consecutive Battle Excellence Readiness Award. The "E" was presented by RADM George P. Koch, Commander Fleet Air Wings, Atlantic. On 15 Sept. 1962 the squadron celebrated its Twentieth Anniversary with awards presentations, open house and an all hands picnic. Upon relinquishing its last P2V-5F to the U.S. 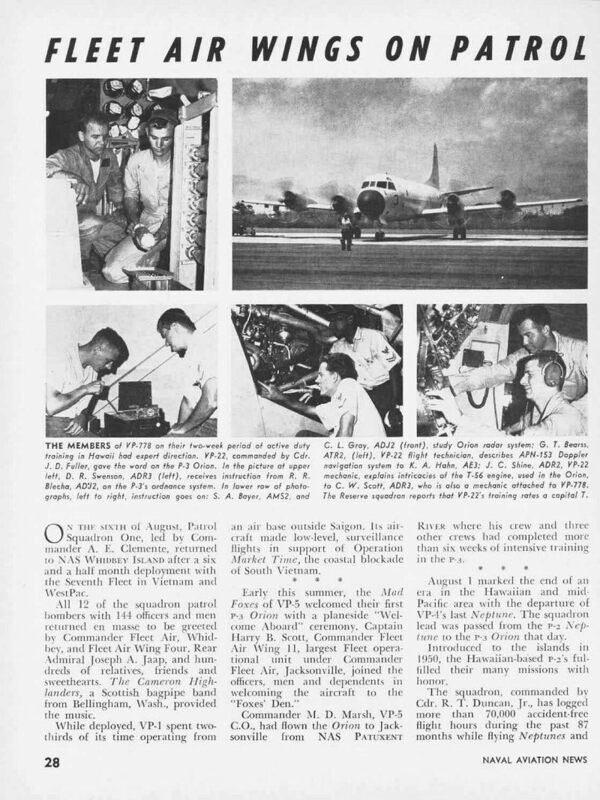 Naval Reserve in October 1962, VP-8 became the fleet's first operational P3A "ORION" squadron, sending detachments to Keflavik, Iceland; Ballykelly, Ireland; Kindley Air Force Base, Bermuda; Argentia, Newfoundland; and other locations throughout the Caribbean to exercise the new weapons system. On October 23, a four plane detachment was deployed to Bermuda as a result of the Cuban crisis. With eight planes, the squadron relieved the detachment daily in order to provide long range surveillance and ASW capability to the blockade. 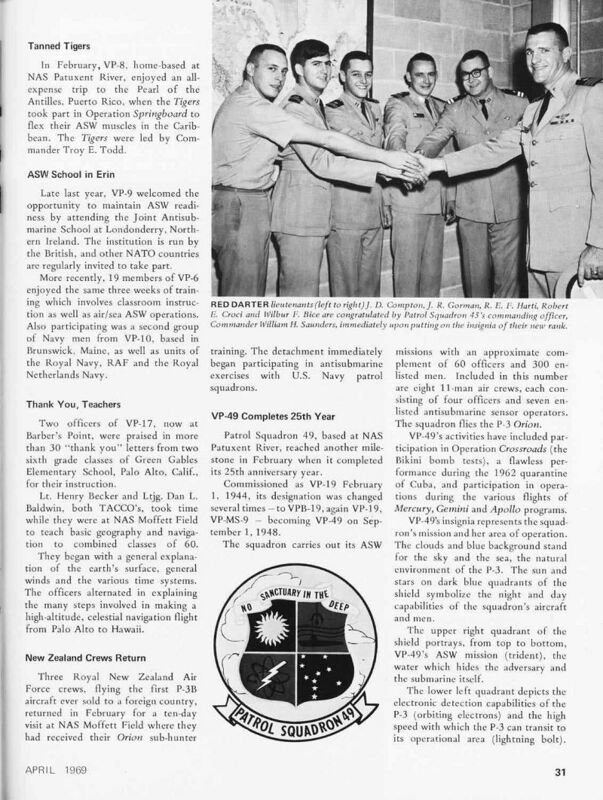 VP-8 was the first Orion squadron to be utilized operationally during this crisis with recommendations for Air Medals..." Contributed by Beth Perry (E-Mail Removed By Request) NEWSLETTER: "VP-8 Alumni Association" World War II Stories, and more!!! 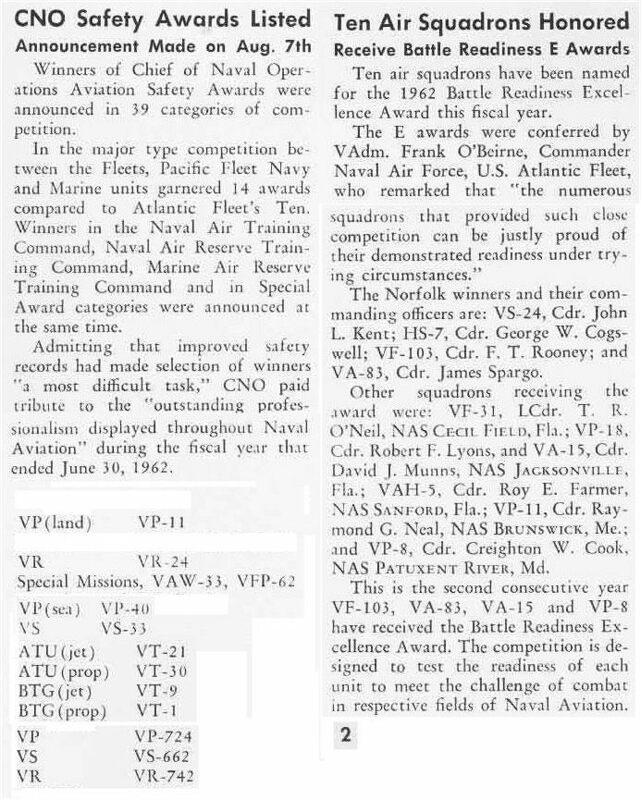 A BIT OF HISTORY: "00XXX61--After moving to a href="naspax.html">NAS Patuxent River, Maryland July 11, 1961, VP-8 was awarded the Battle Efficiency "E" Pennant for fiscal 1960. The distinction was won over all Atlantic Fleet land plane patrol squadrons. 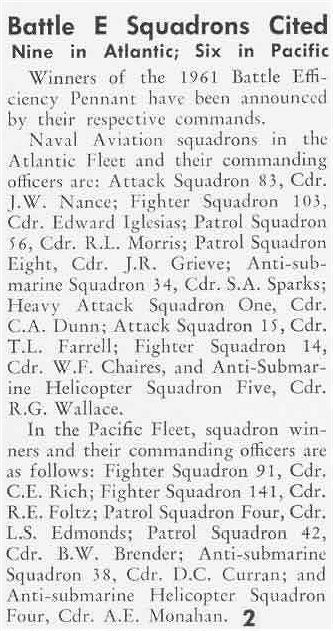 There the squadron was assigned primarily to anti-submarine warfare, and each crew is graded for competitive exercises in pursuit of its mission. These exercises involve all phases of aircraft operational missions, with special emphasis on crew skills in anti- submarine warfare. Flight crews must qualify, then compete in the designated exercises under the watch of a qualified observer on board the aircraft. Under its skipper, Commander John B. ("Big John") Hansen, the squadron's average performance on the exercises was 97%. Four of the squadron's 12 crews posted 100% in all exercises. 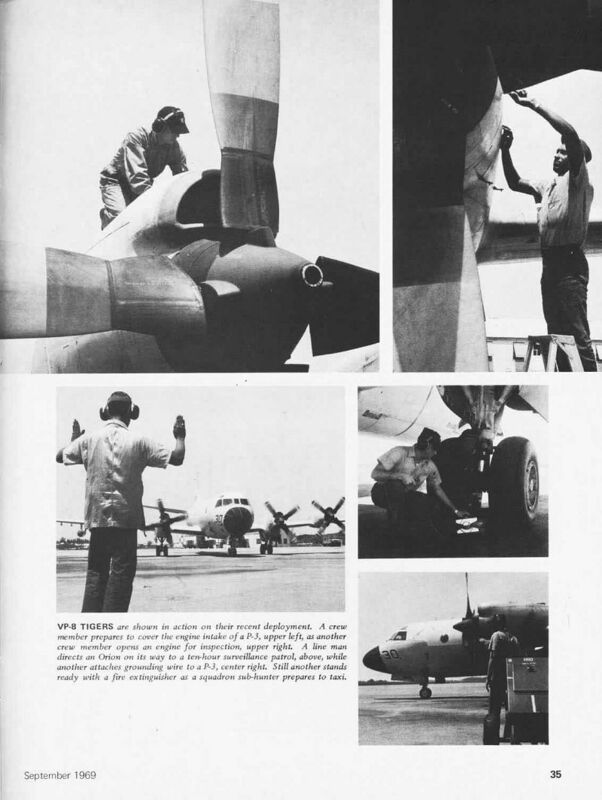 In October, 1961 two aircraft and crews participated in Operation CAPEX, a goodwill mission to South Africa Free States. 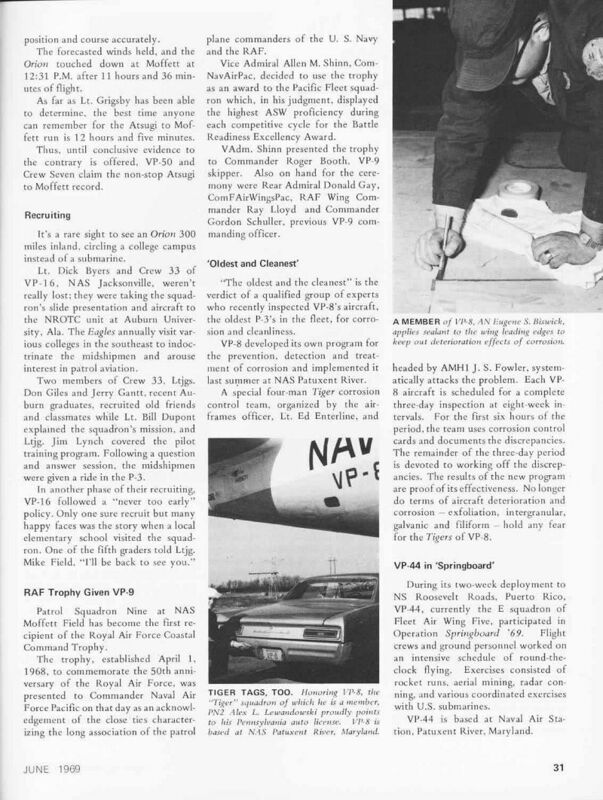 From November 24 through December 9, VP-8 participated in Operations CONVEX providing airborne protection against simulated enemy submarines during convoy operations...." Contributed by Beth Perry (E-Mail Removed By Request) NEWSLETTER: "VP-8 Alumni Association" World War II Stories, and more!!! 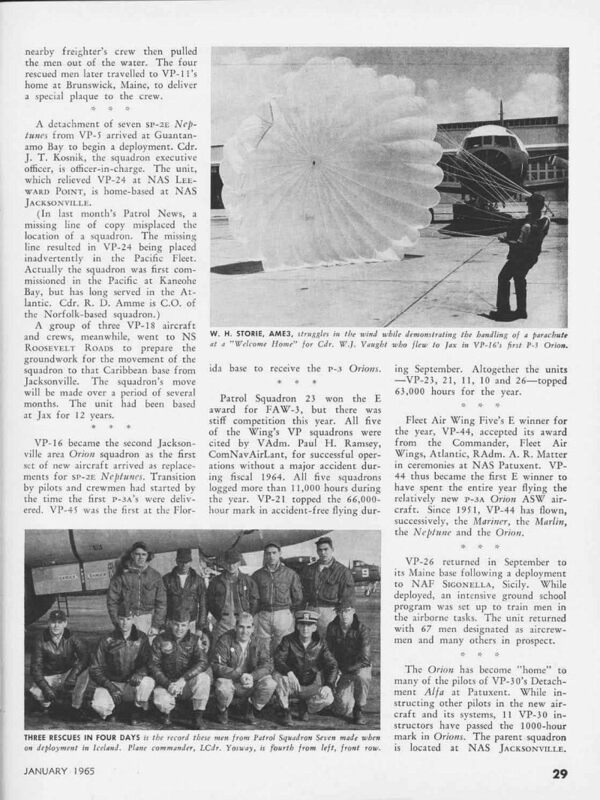 A BIT OF HISTORY: "00XXX60--In January of 1960 Patrol Squadron Eight was relieved of its commitments in Task Group ALPHA by Patrol Squadron Twenty-Four. On March 5, 1960 the squadron deployed to Argentia, Newfoundland. The squadron received commendations from COMBARFORLANT for photo reconnaissance and shipping surveillance during the deployment. 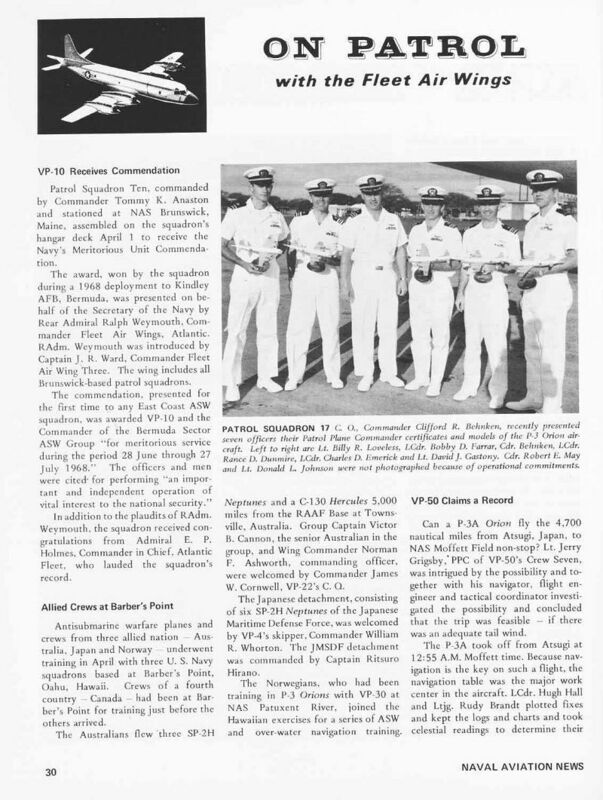 In September 1960 the squadron deployed to Bermuda in support of Maritime Air operations considered vital to national security, returning to Norfolk on September 20th...." Contributed by Beth Perry (E-Mail Removed By Request) NEWSLETTER: "VP-8 Alumni Association" World War II Stories, and more!! !